Posted in Misc and tagged Good Friday at 3:55 pm on January 25, 2018 by Bodger. Just pubs, or also shops/venues/events/etc? That’s amazing. There must be some mistake though. It says the Dail passed the legislation. It was the church keeping the pubs closed, wasn’t it? How could the Dail have changed this by a simple vote? no, but I suspect it was the church had some input into the 90 year old legislation that put the measure in place. The church, far as I can tell, kept largely out of the hoo-ha about allowing opening on Good Friday (perhaps only doing the ‘well, we wouldn’t be angry, but we’d be disappointed’ routine). It was the usual suspects (of whom, I should point out, I wouldn’t count you as one) taking on the role of Defender of the Faith that kept the argument against opening going. I think, for a long time, there was no real (effectual) opposition to opening it’s just nobody got their act together. …sounds about right for our (series of) excuse of a government. It will be beautiful (in a sense that it will be a ragey fuppin car crash!). It might distract him from peddling his antichoice bullplop for a day or two anyway. Huh, there was surprisingly little chat about this. Best headline in ages guys. I, for one, will miss groups of English stag and hen parties standing outside pubs looking confused. Personally I would have kept the ban just to annoy greedy pub owners. There are greedy pub owners certainly. 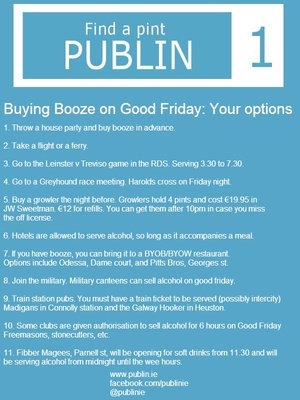 There are also pub owners who like Good Friday as it’s the one day you can give your premises a lick of paint. any reason that can’t be done on christmas day? 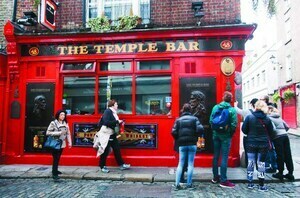 Nothing stopping individual pub owners from closing on Good Friday – if they choose. well i’m still buying a lorry load of cans on the thursday so i can drink to excess on the friday moaning about the telly. i’m a traditionalist like that. So it’s gay murder in public house then. Better not kill the booze. What a beautiful pair of sentences. Listened to David Norris on radio decrying the change. No mention of his travelling expenses to the Seanad. No mention of his travelling expenses to the Seanad. That’s a classic headline lads. That tweet is a load of nonsense. The novelty of good Friday was that with the pubs being closed and lots of people off work, that it was the best day of the year for sessions and house parties. Now it is just another Friday, with more people (i.e. bar staff) having to work. Without wishing to appear a tad/frad* skeptical of this “out of the blue” majority vote, I’m thinking perhaps a sponsorship by Guinness who miss “Arthur’s Day” may be in the mix?